Mountain Living magazine is the only magazine with inspiration and ideas for people who live in the mountains, people who vacation in the mountains, people who own second homes in the mountains, or people who dream of a mountain lifestyle! Each issue of Mountain Living magazine contains features about mountain homes, people, products and activities. Other regular articles in Mountain Living magazine include cuisine, art, architecture, decorating, sports, recreation, entertaining, gardening and travel. Mountain Living Magazine celebrates a lifestyle that can only be experienced in the mountains; from cozy cabins to mountain mansions, gardening, landscaping ideas, summit sports, high country travel and much more. 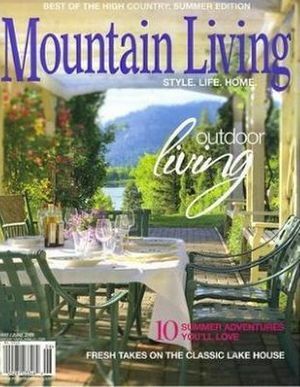 Mountain Living magazine brings the essence of the high country to your home.